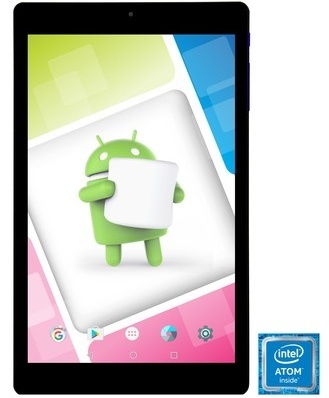 Carrying a price tag lower than $70 USD, this 8-inch tablet comes with an Intel Atom processor and runs Android Marshmallow out of the box. Its specs also include 16 GB internal storage, a 2 MP main camera, and more. E FUN is back with another low-end slate, an improvement of the popular Nextbook Ares 8A, which is now "bigger, smarter, and better than ever." This Android tablet is already available online at Walmart.com, as well as at select Walmart brick-and-mortar stores. The official press release does not get too technical, but reveals a quad-core Intel Atom processor, 16 GB internal storage and up to 128 GB microSD support, the 8-inch IPS display with 1,280X800 pixels, up to 8 hours of battery life, 0.3 MP and 2 MP cameras, micro USB and micro HDMI connectivity, and more. The list of preloaded apps includes the Barnes & Noble NOOK app, VUDU Movies and TV, and the Flixster app, next to the usual Android Marshmallow apps from Google, including the very popular Play store. E FUN's Nextbook Ares 8A tablet can be acquired for a price of just $68 USD. The only color available appears to be black. Plus…The new Nextbook Ares 8A Android tablet has an 8" 1280 x 800 IPS touchscreen with 16:10 aspect ratio that ensures easy operation and crisp, sharp, high-definition images. Fast, smooth performance is provided by its Android 6.0 Marshmallow operating system. Its Intel Atom quad-core processor lets users play games or stream videos smoothly and quickly, while a built-in micro HDMI port allows videos, streaming content, and other high-definition material to be shown on any compatible TV. A rechargeable Lithium Ion battery provides up to eight hours of battery life.Availability and PricingThe Nextbook Ares 8A Android tablet is available at nearly 3,900 Walmart locations across the country and through Walmart.com with a MSRP of $68. About E FUNE FUN, a designer and marketer of mobile lifestyle products, entered the North American market in 2010. Since then, E FUN has grown to be one of the leading tablet brands at retail, achieving top five market share by volume in 2016. Its ongoing product innovation and partnerships set E FUN apart from competitors and provide customers with unique out of the box experiences. Its product offerings include and extensive line of Android and Windows tablets. E FUN is headquartered in West Covina, California.For additional information regarding E FUN's Nextbook tablets, visit www.nextbookusa.com.